A minimum-wage pre-emption measure, backed by the hotel industry and signed by Governor Chafee, has been met with hunger strikes, electoral challenges and protests. Last Tuesday, four women sat in folding chairs on the steps of the Rhode Island State House in Providence and refused to eat. Santa Brito, Mirjaam Parada and Yilenny Ferreras—all Providence hotel workers—and Shelby Maldonado—a city councilwoman from nearby Central Falls—had declared a hunger strike to protest a measure inserted into Rhode Island’s budget that would prohibit local governments from boosting minimum wages for their residents. Supported by the hotel workers union, Unite Here Local 217, the women said they wouldn’t eat until Governor Lincoln Chafee vetoed the budget. At stake was a city ordinance, backed by the union, RI Jobs with Justice, and other community groups, which would raise the minimum wage to $15 an hour for workers in large hotels. The city council had just voted to put the proposed wage increase on the November ballot. But last Thursday, just two days after the workers began their strike, Chafee signed the budget—making Rhode Island the first state with a Democrat-controlled legislature to pass a minimum-wage pre-emption measure. Supporters of the measure—hotel owners, their lobbyists, and the Statehouse leadership—argued that allowing cities to set their own minimum wage would be bad for economic development. The Rhode Island Hospitality Association (RIHA), a hotel industry trade-group who vociferously opposed the wage increase and publicly advocated pre-emption, has contributed heavily to state-level campaigns in recent years. Senate President Teresa Paiva-Weed, who presided over the swift passage of the budget in her chamber, has received more money from RIHA than any other Rhode Island politician. Representative Maria Cimini of Providence was one of just seventeen representatives—out of seventy-five—who voted against the pre-emption measure in the House. “I don’t think the state should usurp the authority of municipalities to do what they believe is right for their communities,” she told The Nation. 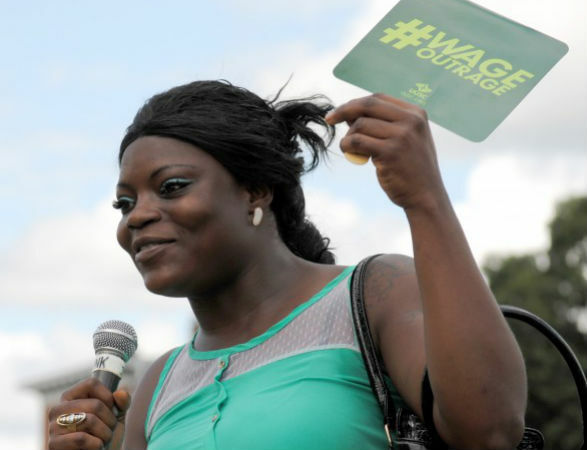 But supporters of the living wage movement are not giving up. Councilwoman Maldonado, who is also a union organizer, filed papers this week to challenge incumbent Democratic State Representative Agostinho Silva to represent Central Falls in the state legislature. Silva voted for the pre-emption measure and is a close ally of House Speaker Nicholas Mattiello, who championed the wage ceiling. And workers haven’t ceased organizing. Yesterday, the Unitarian Universalist General Assembly—who were in town for their annual conference—joined local faith leaders and hundreds of hotel and fast-food workers in a rally for living wages. After marching through downtown Providence, chanting outside chain stores along the way, the group gathered in front of the Renaissance Hotel. “The people working in these hotels and fast-food chain restaurants deserve basic human decency,” said James Ford, Senior Minister at First Unitarian Church in Providence. “We have a special obligation to stand with our brothers and sisters, immigrants and the working poor, and it is our privilege to do so today.” Months ago, the Unitarian Universalists responded to the boycott called by Santa Brito and her coworkers by canceling 850 rooms reserved for their conference at the Renaissance. Ultimately, the General Assembly did pass a small state-wide wage increase, from $8 to $9 an hour—and some believe the hunger strike contributed to wringing that small victory from the conservative leadership in the statehouse. Sam Adler-BellSam Adler-Bell is an intern at The Nation, Asst. Essays Editor at Wag's Revue and campaigner with Demand Progress. He lives in Brooklyn. Follow him @SamAdlerBell.